Individual Formwork stands for solutions that PERI individually plans and pre-assembles. In contrast to so-called project-specific solutions, what is meant here is formwork which undergoes stationary prefabrication before use. This is then the case if production on the construction site is not possible; either due to the very complex design or because special tools and machines are required. 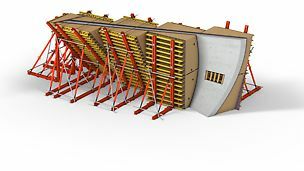 The prefabricated formwork elements are subsequently quickly and easily connected on the jobsite to produce the complete formwork. With so-called free-form formwork, the highest architectural demands on geometries and surfaces can be realized. Such unique pieces are quite cost-effective due to the high proportion of standard elements, e.g. formwork girders and steel walers, which are re-used after the free-form formwork has been dismantled. In addition, individual formwork is also used for monolithic construction, when identical building structures are to be realized in large quantities, for example, social housing projects. In the process, always using the same system ensures extremely short assembly times and fast construction progress.